IAF attacks targets in Syria after Iran's Qods Force fired a barrage of 20 rockets toward the Golan Heights. The Israel Air Force attacked Iranian targets in Syria overnight Wednesday, the IDF’s Arabic-language spokesman said. “Any Syrian attempt to respond will be met with a harsh Israeli response," he added. Syrian media reported that the Syrian army shot down dozens of Israeli missiles launched at Syria. "Dozens of missiles were shot down in Syrian airspace by anti-aircraft systems," the official SANA news agency said, without specifying if the missiles were aimed at the Syrian capital, where explosions were heard. The report added that the Israeli missiles hit military bases, as well as an arms depot and military radar. 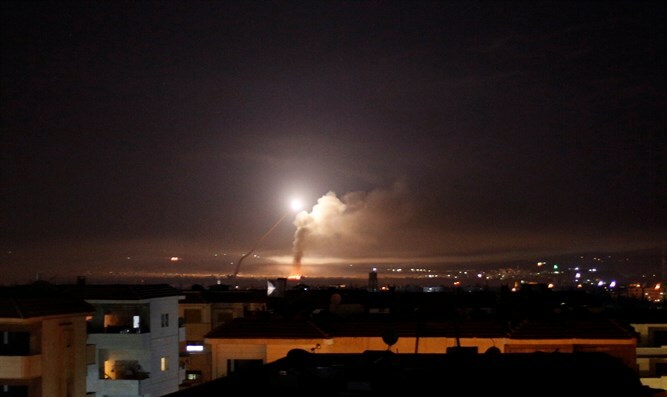 The Israeli attacks came hours after the Iranian Qods Force fired a barrage of 20 rockets at IDF forward posts on the Golan Heights around midnight on Wednesday night. A number of rockets were intercepted by the IDF's Iron Dome aerial defense system. No injuries were reported. “The IDF views this event with great severity and remains prepared for a wide variety of scenarios,” said the IDF Spokesperson’s Unit. Residents of the area were asked to stay in protected spaces for a few hours before being given the all-clear. Earlier on Wednesday night, moments before the rocket fire on the Golan, Syrian media reported that Israel had attacked Syrian army posts in the Quneitra area of the Syrian Golan Heights. One of the reports claimed that, among other things, a post that serves as a base for Hezbollah was attacked. The Syrian Observatory for Human Rights said that at least 15 people were killed in the attack, including eight Iranians. The organization claimed that Israel was behind the attack. Israel would not comment on the report.